Hopefully at least a few students are around here that I haven't been in contact yet, but I feel most of you will still enjoy hearing some of this information. I'm the president of the newly named student section, Purple Reign. We've gotten off to a good start this semester so far. We've set up text alerts for the students for home games, contacted Greek life on campus to encourage them to go to games, and have been working our hardest to get as many people as possible into Meeks for volleyball games for the time being. All that being said, even more significant changes are coming for basketball season. We've worked with the athletic department to secure a shuttle for students to and from the Ford Center for almost every home game! There's more details we're still trying to work out with exactly how the shuttle will work, but providing students reliable transport for free I believe will be a huge game changer when paired with the excitement for this upcoming season. Even more exciting yet is our new rewards app, specifically for students. Students are now able to check into games to earn points, then redeem those points for items from the bookstore, t-shirts, or food from one of the many sponsors (including but not limited to Azzip Pizza, Turoni's, Papa John's, Domino's, Wayback Burger, Bar Louie, Backstage, and more). I'm now looking into Azzip and Chipotle giveback nights where we could earn a percent of sales from those who mention us as they checkout and turn that revenue into support for theme nights, t-shirts with the Purple Reign imagery, or (my ultimate goal over the next two years) a packed bus trip to one of our nearby opponents. Hoping to make this year a great one! Go Aces! Great news and excellent work!!! You are the man!!! Great job....hope your hard work pays off at the Ford this year. Would love to see crowds as loud and crazy as the year they did the "Harlem Shake" and of course those at Roberts! Just my opinion...I could be wrong! Just wanted to drop in and let everyone know we have an Azzip Giveback night on Tuesday, December 4 at the N. Green River Rd loacation. I posted on the Aces High page on Facebook as well. Just show them the flyer at checkout and Purple Reign receives 20% of the profits from the night! Thanks! PurpleSuitMan wrote: Hello again, all! SI_Acesfan wrote: Great news and excellent work!!! I second this ! Keep up the good work !!!! 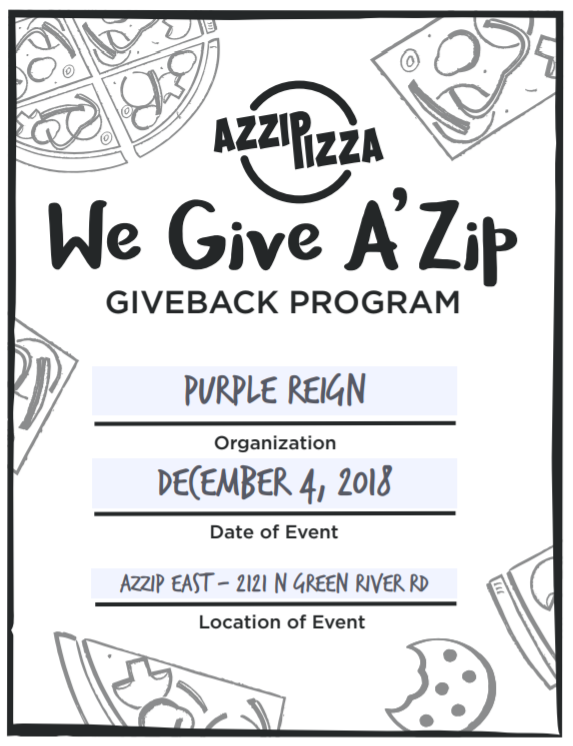 Quick reminder, the Azzip Giveback for Purple Reign is today! Please consider stopping by their N. Green River Rd. location and presenting this flyer at checkout to support Purple Reign!